human trafficking map | Stop Human Trafficking in Southern Africa! Some people have written to ask why SAAHTT as an organisation focuses on the whole SADC region. Addressing trafficking within the SADC bloc as a whole is indeed a very daunting task. In fact, human trafficking alone is big enough a problem without even going further to look at human trafficking within all the SADC states. However, for us this represents an innovative approach to the whole challenge of trafficking. While there is internal trafficking, it is commonly understood that human trafficking involves the crossing of national borders. It is essentially a transnational crime and therefore any effective attempt to address it should be focused on bordering countries. We continue with our analysis of the US State Department Human Trafficking Report of 2010. So we have looked at Zimbabwe and Zambia and clearly Zambia is making significant efforts to address human trafficking. This is particularly in view of the enactment of its Anti-Human Trafficking Act. In this post we will go on to look at Namibia. The country is a Tier 2 country-it does not comply with the minimum standards of the addressing trafficking but is making significant efforts to comply or to address the crime. With regards to minimum standards, the benchmark is the Trafficking Victims Protection Act (TVPA). We will explain more on the TVPA in a later post suffice to state that it is a landmark legislative instrument in the United States that is used to combat trafficking. Namibia is a source, transit and destination country for victims of trafficking. Children are trafficked and forced into child labour in agriculture, domestic servitude and charcoal production among other things. They are also transported by truck drivers to countries such as Angola and South Africa and are forced into prostitution. We will use the same format we used to look at the Zambian country narrative, the same format in the Trafficking in Persons Report. We will look at the three P’s, which is, Prosecution, Protection and Prevention. Prosecution: The National police and the Ministry of Justice did not handle any trafficking cases in 2009. The government, however, enacted the Prevention of Organised Crime Act which explicitly criminalises all forms of human trafficking. The penalties for traffickers are sufficiently deterrent as traffickers can be incarcerated for up to 50 years. Other pieces of legislation such as the Labour Act and the Draft Child Care and Protection Bill sufficiently or will sufficiently address forced labour and child rights issues. The police ran an anti trafficking hotline for suspected trafficking cases tip-offs. Protection: Due to the lack of financial capacity to offer support to victims of trafficking, the Government of Namibia worked to ensure victims access services offered by non state actors. The government has no formal procedure of referring victims to organisations that can assist although the police have the responsibility of ensuring that victims access short term shelter and assistance. Over a 100 cases of child labour were handled by the Ministry of Labour and Social Welfare while the Ministry of Gender Equality and Child Welfare handled 3 trafficking cases. The MGECW also created a national database for gender based violence and this will also contain statistics on forced labour and trafficking. Government officials also began renovating 13 houses across the country to house victims of violence and trafficking although these safe houses will mainly cater for women. It is also important to note that there is still limited understanding of what constitutes trafficking thereby giving rise to concern that some victims of trafficking may have slipped through the system. Prevention: The government launched a country wide media campaign to raise awareness on gender based violence and trafficking encouraging people to report suspected cases. The Ministry of Home Affairs worked with UNICEF and came to an agreement to have offices at hospitals and to deploy mobile units to provide birth certificates to newborns and identity documents to orphans and vulnerable children. Although there was training for some government officials, the numbers were fewer than the training provided in the year 2008. While the country took the notable step of enacting anti trafficking legislation there is now clearly the need to build capacity to enforce this legislation. There is also a need to continue to conduct anti trafficking awareness raising campaigns. The government should also come up with formal procedures of referring victims to non government agencies especially as it currently does not the capacity to assist trafficking victims. For the full Namibia country narrative in the Trafficking in Persons report go here. In the previous TIP feature post we blogged on Zimbabwe. In this, the second feature on SADC countries and how they fare in the latest TIP report, we focus on Zambia. But unlike the Zimbabwe feature, we will not paste the actual word for word transcript of the Zambian country narrative in the TIP 2010 report. Instead, we will just feature, key takeaways or main points from the report. This change has been largely necessitated by the feedback we have gotten from the first post on Zimbabwe to the effect that the post was too long and therefore people found it onerous to read. So you have spoke and we have listened :). We will just pick up the main points and link to the full Zambian narrative in the TIP report. Zambia is ranked as a Tier 2 country-this means that Zambia does not comply with the Trafficking Victims Protection Act’s ( TVPA’s) minimum standards (minimum standards to eliminate trafficking) but is making significant efforts to do so. So this is quite commendable. Although there is still a lot the country can do to address trafficking. It remains a source, transit and destination country for people who are then forced into commercial sexual exploitation and or forced labour. Most of the trafficking that occurred in the period under review was internal trafficking or trafficking within the borders of Zambia. In some rural areas in Zambia it is considered a status symbol to have children in the urban areas and thus families sometimes send their children to urban areas where they fall prey to traffickers or are forced into forced domestic servitude. There were also reports and suspicion of trafficking in the Copperbelt mining areas as Chinese and Indian migrants are forced to work the mines in inhospitable conditions and living in totally secluded living quarters. 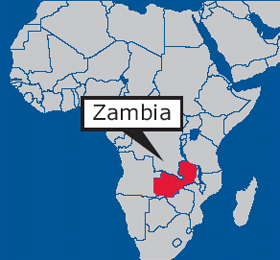 Trafficking to South Africa through Zambia was also reported as the country has porous borders. Prosecution– there was a noted increase in anti-trafficking law enforcement efforts (Zambia has a comprehensive Anti-Human Trafficking Act which was passed in 2008). Two men were prosecuted under the new act which carries a sentence of up to 25 years. There are nine new trafficking prosecutions that are pending. In terms of capacity building, the government in partnership with IOM distributed simplified copies of the new anti-trafficking law at border towns or areas in Zambia. A total of 120 police offices with specific anti trafficking training graduated from the local police training academy. Local NGOs involved in anti-trafficking also trained the police, police prosecutors, local court justices and magistrates in the skills necessary for investigating and prosecuting child trafficking cases. In addition, the Zambian Police’s Victim Support Unit (VSU) forged a partnership with an NGO to revise its data collection on trafficking to improve monitoring and reporting. Protection– The government of Zambia has not developed or implemented systematic procedures for the identification of trafficking victims and there is no formal mechanism for referring victims to NGOs for protective services. Other projects for victim protection such as is mandated by its anti trafficking law, e.g. setting up of shelters for victims, have not funded. However, officials informally referred 33 victims to IOM for protection services. In addition, the government did not penalise victims for unlawful acts committed as a direct result of being trafficked. Kudos! Prevention-The Cabinet approved a National Plan of Action on human trafficking and established an inter-ministerial anti trafficking secretariat. The government was also part of IOM’s ‘Break the Chain of Human Trafficking Campaign’. To counter the high incidences of internal trafficking, 50 traditional leaders or chiefs were engaged and trained on anti human trafficking. This is in recognition of the family unit in rural areas and the respect, authority and responsibility the traditional chiefs command. The Police’s VSU featured trafficking on its weekly ‘Police and You’ radio campaign. The government also supported various efforts by partners by high level attendance, participation, issuing public statements and seconding speakers.